I hold some QLD and I bought some ALXN. 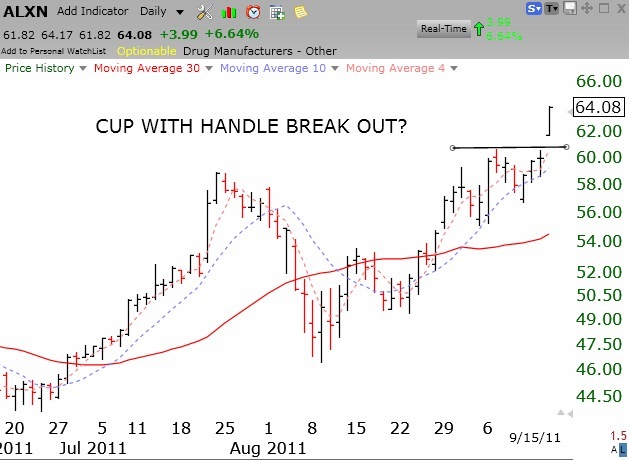 ALXN may have had a cup with handle break-out on Thursday on high volume. Note the pivot point at the top of the handle, designated by a horizontal line. Click on chart to enlarge. ALXN is at an all time high. Here is a good discussion of the company’s products. Dr. Wish, didn’t you post a good illustration of the performance of the leveraged ETF (QLD) vs. top IBD 50 stocks? Are you following your trading plan? Just ribbing you a bit. ALXN looks like a solid breakout.